First, a small bit of good news. According to the Diabetes Report Card 2017, a biennial report by the Centers for Disease Control, the rate of new U.S. cases of diagnosed diabetes among adults is falling. The not so good news? The rate of new cases among children and adolescents as well as overall prevalence in adults has gone up. Indeed, most everyone has a friend, relative or are themselves dealing with the lifestyle changes needed to manage this health condition. The International Diabetes Federation (IDF) notes that globally one in 11 adults has diabetes (that's 425 million, of which half are undiagnosed). Diabetes contributes more than its fair share to our soaring healthcare costs. IDF reports that $727 billion, 12 percent of global health expenditure, is spent on diabetes. Are Americans concerned, and does it impact their food choices? A May Food & Health Survey from International Food Information Council asked, “Which of the following health benefits are you most interested in getting from foods or nutrients?” Some 20 percent ranked cardiovascular health as their top desired benefit, followed by weight loss/weight management (18 percent), energy (13 percent), brain function (9 percent) and then diabetes management/blood sugar, with 8 percent saying it was the benefit they were most interested in obtaining. Dietary guidance for the prevention of type 2 diabetes focuses on weight management. For example, the CDC recommendations include eating at least five servings (half a cup each) of fruits and vegetables per day, less fatty and fried foods and two to three ounces of meat, fish or poultry at lunch and dinner. Other recommendations include drinking little or no alcohol and consuming water instead of sugary drinks; switching to breads and cereals with high fiber content; and, using fat-free or low-fat dairy products. Although following such advice would go a long way to improve the health status of consumers, as too often is the case, specific food components are singled out. Only 38 percent of respondents to IFIC’s survey were able to name a food they would seek for their top health issue. Yet when asked "What source of calories is the most likely to cause weight gain?" 33 percent identified sugars and another 25 percent said carbohydrates. Only 17 percent believe calories from all sources impact weight the same. Some 77 percent of those surveyed reported that they were trying to limit/avoid sugars. Soft drinks, candy, baked goods (cookies, cakes, pastries) and frozen desserts were the food categories most often avoided. Only some 30 percent of respondents said they were using the Nutrition Facts label to choose foods and beverages with less sugar. However, the impending implementation of the new Nutrition Facts panel requiring labeling of added sugar may well change that. Despite controversy over how and why the labeling requirement has come about, the issue has been well studied. A post to the LinkedIn "Food Label Community" group pointed out a list of nearly 100 federally funded research studies from 2017 to 2018 regarding "added sugars" and "sugar sweetened products." Many studies again intertwine the issues of sugar, diabetes, obesity and related diseases. As Debra Topham, director at Knowledge Bank, reminded other participants to that LinkedIn group, in the 2016 Federal Register, the FDA cited cardiovascular disease and not diabetes as the primary reason for mandating added sugars in the Nutrition Facts update. Food manufacturers are feeling the need to act. 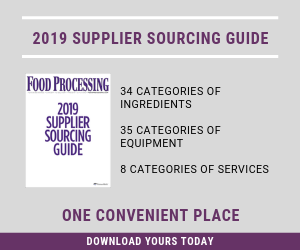 One-third of respondents to Food Processing’s 2018 R&D Survey reported that “removing added sugars” was an ingredient that they’d be “adding to or subtracting from formulations.” That effort was one point behind “Removing GMO-ingredients,” the topic eliciting the greatest concern. Claudia D. O’Donnell is co-owner of Global Food Forums Inc. (www.globalfoodforums.com).